I bid you Holiday cheer with another fabulous giveaway from Pur Minerals in cooperation with Rustan's! In this giveaway, one lucky winner will receive a Pur Minerals Essentials Collection Kit. I have been using this product for over a year and I love it! I'm sure you will too! 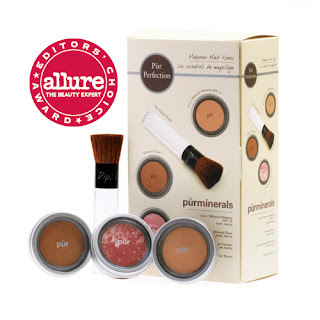 This Pür Minerals mineral makeup starter kit is pür-fectly packaged and portable! These travel sizes of our most popular mineral makeup products will be the bait to get you hooked on Pür Minerals! Once you have experienced the beauty of mineral makeup, you will never go back to traditional cosmetics. 4-in-1 Pressed Mineral Makeup (.15oz): The cornerstone of Pür Minerals, this one-minute mineral makeup miracle is your mineral foundation, powder, concealer and SPF protection all in one neat makeup compact. Completely free of oil, alcohol, fragrances, preservatives and chemical dyes, this mineral foundation is actually good for your skin! Mineral Glow (.12oz): A touch of sun in a makeup compact, this mineral powder will impart a natural, sun-kissed glow to your skin. Universal Marble Powder (.10oz/3g): Give your skin back that rosy glow you were born with. Porcelain through Tan Start Now kits come with Marble Powder in Pink. Medium Dark through Deepest include Marble Powder in Spice. This multi-purpose mineral makeup can be worn on your eyes, lips and cheeks. The Chisel Makeup Brush: The magic behind the mineral makeup look! The only makeup brush to use for application of your 4-in-1 Mineral Makeup, it provides maximum coverage and an amazingly smooth finish. With this kit, you can achieve perfect make-up in under 5 minutes that lasts all day! Follow me on Twitter and tweet: "I want to win a Pur Minerals Essentials Kit from Rustan's at www.fashioneggplant.com @sarahtirona"
Leave a comment with your GFC name, name, email address, tweet url and FB url. I have tweeted this giveaway! GFC name, name, email address, tweet url and FB url. Happy New Year! I'm joining! I'm following you via GFC as "joey ♔"